That’s why in 2014, WildAid and our conservation partners launched “Stop Using Rhino Horn," a three-year campaign with support and cooperation from the Vietnamese government as well as business leaders and media partners, who have contributed $1.6 million in donated media that has reached millions of consumers. 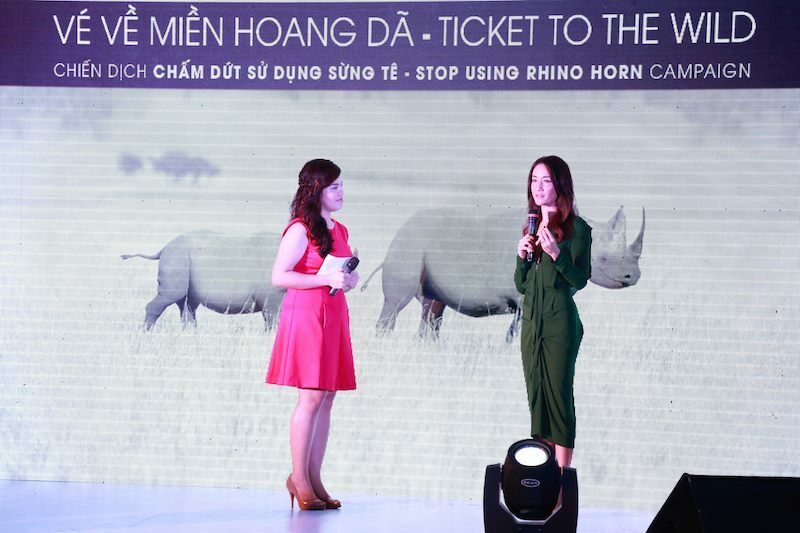 On Friday, WildAid’s Vietnam team welcomed Vietnamese-American actor Maggie Q, star of the hit CBS series "Stalker," and Deputy Chief of Mission of the U.S. Embassy Claire A. Pierangelo to a launch event in Hanoi for the second year of Stop Using Rhino Horn, which now boasts over 40 Vietnamese celebrities spreading this important message. “I am proud to be here as my mother is from Vietnam. It saddens me to see the news of the record number of rhinos killed so their horns can be sold in Vietnam,” Maggie Q said in remarks at the event, which she attended with fiancé and "Stalker" co-star Dylan McDermott. “I would like to help make people aware of the devastating impacts of this trade and persuade them to stop buying rhino horn." While in Vietnam, Maggie and Dylan will join WildAid's team in other events and activities, including the “Ticket to the Wild” event in Ho Chi Minh City with many campaign ambassadors, partners and friends. They will also visit the Cu Chi Wildlife Rescue Center to promote pangolin conservation. In addition to raising awareness with our partners, African Wildlife Foundation and CHANGE, we're committed to assisting the Vietnamese government in strengthening the nation's law enforcement efforts. The campaign will provide professionally trained detector dogs to Vietnam Customs in a joint partnership between WildAid, Working Dogs for Conservation (WDFC) and Vietnam Customs. Two dogs currently are being trained in the US to be able to detect several different wildlife scents, including rhino horn, ivory, tiger, and pangolin products, at Hai Phong Seaport in September. 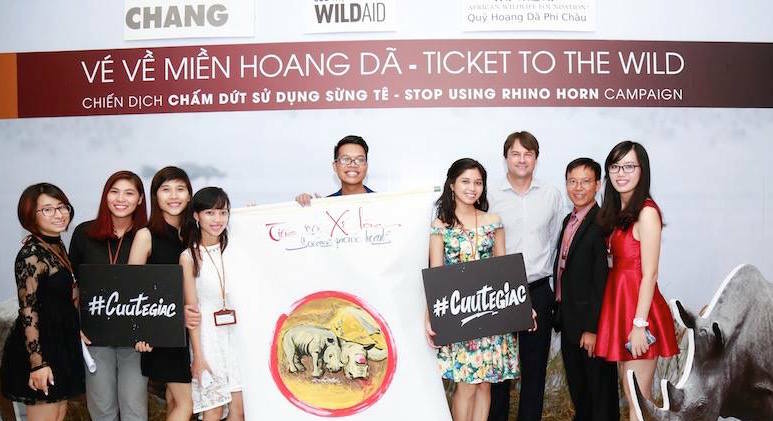 Beginning last month, WildAid’s campaign also coordinates with Operation Game Change, an alliance to curb wildlife trafficking in Vietnam, especially the rhino horn trade, supported by the U.S. Embassy. "With a shared vision Vietnam and the United States are seizing new opportunities and momentum to take stronger action against wildlife crime," DCM Pierangelo said at the event. "The United States is strengthening the skills of Vietnam's law enforcement officers while forging partnerships to reduce demand in wildlife products." Maggie Q and WildAid ambassadors from Yao Ming to David Beckham are joined by a growing number of Vietnamese artists in calling for an end to rhino horn consumption, including singers Thanh Bui and Thu Minh; actor Hong Anh; musician Quoc Trung; MC/producer Anh Tuan; and Mrs. World Thu Huong. They’re among over 40 Vietnamese celebrities who actively participated in the campaign’s awareness-raising activities last year. 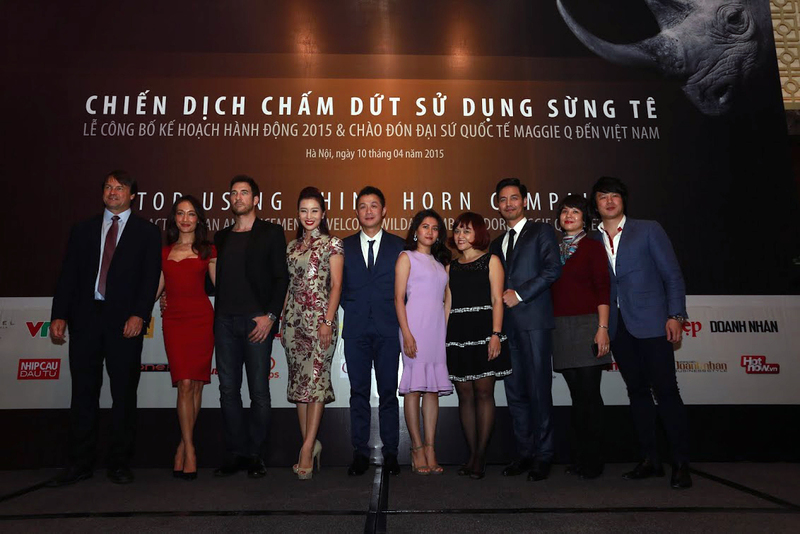 Stop Using Rhino Horn Campaign 2015 is thankful to the support from media partners: VTV, VTC, An Vien TV, Star Media, Chicilon Media, FBNC, YanTV, TVShopping, Dat Viet Newspaper, Nhip cau Dau Tu, Dep, The Thao Van hoa Dan ong, Outlook, Doanh nhan, Cam nang Mua sam, Phong cach Doanh nhan, GaFin, XoneFM, Nam Hương Communications Company, Ogilvy & Mather, T&A Ogilvy, POPs Vietnam, tinmoitruong.vn, tttd.vn, hotnow.vn. The press conference was sponsored by Sofitel Plaza Hanoi Hotel and DHA company.